Cubs Stellan and Jytte survived their treacherous trek across the Nunquivik, but their quest to rescue their mother has only begun. Svenna is imprisoned at the sinister Ice Clock-the headquarters of the Grand Patek whose dangerous influence is spreading throughout the bear kingdom. Only one bear has ever stood up to the Grand Patek-Svern, the cubs' father, a famous warrior who's been in exile for years. And so, along with their friend Third, the cubs set out to find Svern in the legendary Den of Forever Frost-a place some bears claim never existed at all. But time is running out. The Grand Patek has a secret weapon at his disposal-one with the power to destroy everything the creatures of Ga'Hoole hold dear. 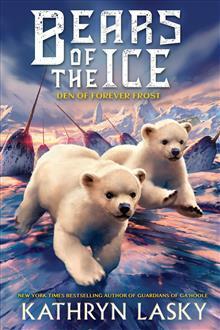 In this second book in the Bears of the Ice series, bestselling author Kathryn Lasky lures readers deeper into a vividly-imagined fantasy world full of magic, adventure . . . and animal heroes unlike any other.